This week at CASE Study #52 we are challenged to CASE someone's work that inspired us. 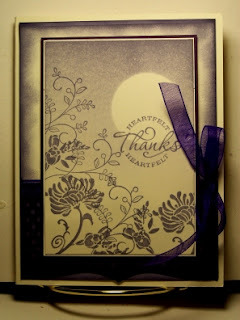 Follow this link to see what Teneale Williams card inspired me! I have to say that I went through some of the previous challenges but it was the card made by Teneale that really caught my eye and my breath! I hope I did her creation justice. Thanks to all the ladies at CASE Study for always inspiring and challenging me. This is also a study in Purple using Stampin' Up! Wisteria Wonder ink. Some Stampin' Up! stamps and dsp along with some Very Vanilla cs. Gorgeous! So elegant. Well done. How glorious, Betty...Teneale is a wonderful card maker and you've done her card justice! I love the lavender colors, the flourish-y stamps and the beautiful coordinating ribbon! An awesome CASE! Thanks for playing along with us at CASE Study! A truly beautiful card! Love the sponging to create the moon! Thanks so much for joining in the fun on CASE study this week! This is a fabulous take on Teneale's gorgeous creation! !loving the purple tonings and the detailed boarder at the bottom!